Although we have baked many chocolate cakes from scratch and box mixes before, we decided to experiment with making a miniature one in a mug. It is quick to prepare as a snack when one gets a chocolate craving without having to bake and decorate a big, decadent dessert. 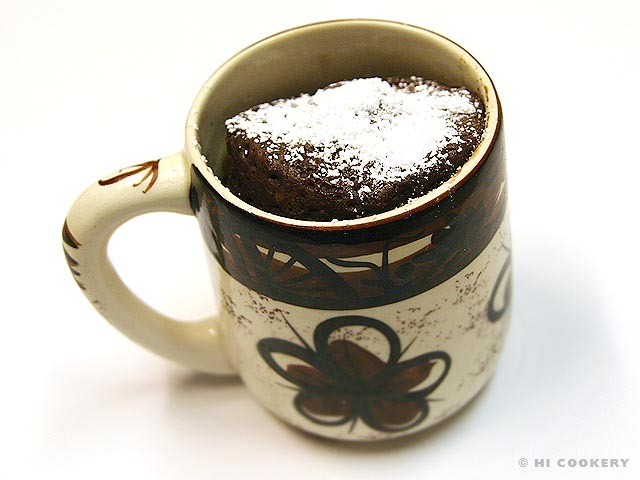 We admit that a chocolate mug cake cannot be compared to the oven-baked kind. But it was a unique recipe to try at least once for National Chocolate Cake Day. 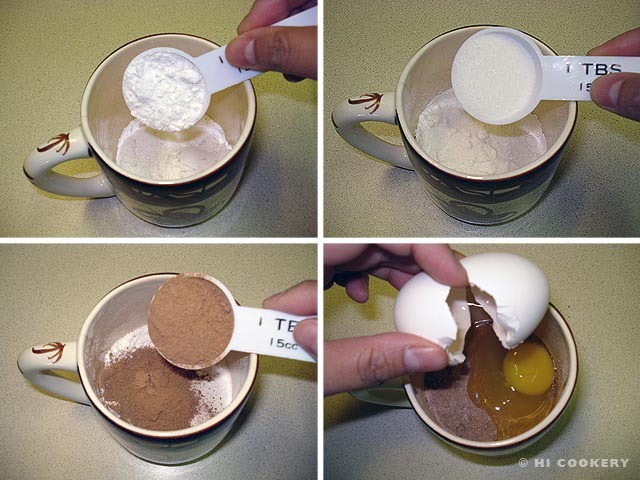 In a large, microwave-safe mug, combine the flour, sugar, cocoa and egg. 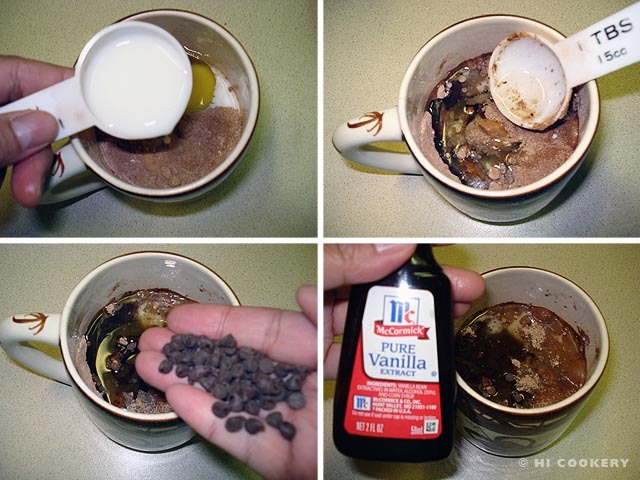 Mix in the milk, oil, chocolate chips and vanilla. Stir until the batter is smooth. Microwave on high for 3 minutes. The chocolate cake will rise in the mug while cooking. Carefully remove from the microwave and wipe off any drippings. Sprinkle with powdered sugar (optional). Serve and eat at once before the cake deflates and hardens. Thanks to our friend Lisa L., a mom in the Navy, for suggesting this chocolate mug cake recipe from the Navy for Moms website. The chocolate mug cake is quite dry. Serve with a fudge sauce or ice cream for moistness. 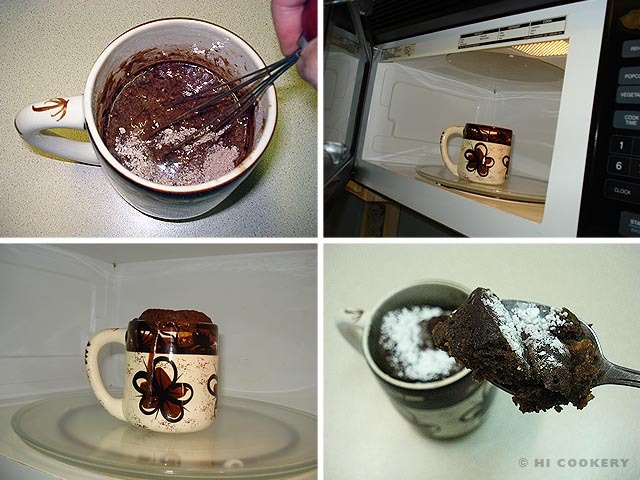 Eat this chocolate cake right out of the mug as it does not look too appetizing when inverted onto a plate. If serving in the latter way, mist the mug with cooking spray or lightly grease with oil before mixing the ingredients inside. Search our blog for other (better) chocolate cake recipes.